Certain organizations may not be eligible (Governmental entities, Hospitals, Schools). Campaigns must be actively managed. Google’s Grantspro program offers the opportunity to receive an increased spending cap of $40,000 in non-profit advertising each month. This represents an additional $30,000 added to the existing Google Ad Grants account of $10,000 per month, equaling an incredible opportunity for a total of $40,000 each month in free advertising. There are more stringent eligibility requirements, but if you meet them and get approved, this type of additional advertising budget can be incredibly valuable to just about any 501(c)(3) nonprofit organization. Our team has been successful in helping accounts realize the benefits of expanding their reach through the Google Grants program by maximizing the financial opportunity available. This includes experience in meeting the criteria necessary to become eligible for the increased GrantsPro program. Take advantage of this amazing opportunity and increase your nonprofit advertising efforts right away. 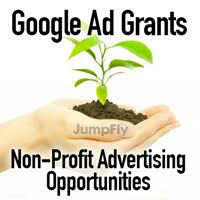 Contact JumpFly today and learn how we can help you apply for and manage your Google Grant advertising account. Copyright © JumpFly, Inc. All Rights Reserved.